How do I know that I have enough bone for a Dental Implant? Why do we use Straumann® and Dentium dental implants? What shall I do after dental implant surgery? Why is regular check-up important after dental implant surgery? What does the dental implant cost depend on? A dental implant is an artificial tooth made of titanium and placed into the jawbone beneath the gums for holding a bridge or replacement tooth. They provide a strong foundation for your permanent or removable replacement teeth that match your natural teeth. The main objective is to achieve close contact with the surrounding bone. Further growth of the bone onto the implant surface will improve the stability of the implant over time. Usually, implants have some kind of screw thread internally that enables to fit different components easily. After they have fitted, the components provide complete support to bridges, crowns or dentures for a long time. It is a suitable option for the ones who have missing or lost teeth due to some injury or periodontal disease. Watch the video on dental implant surgery in London to give you an idea on implant dentistry procedure and know about cost associated with the treatment. If you feel embarrassed to smile in public or certain diet because of missing teeth, then dental implant is the right choice. Unlike fixed dentures or other missing teeth solutions, dental implants have a natural and more comfortable feel. Adjacent teeth might shift towards the gap which makes the dentures become loose. This may be the reason why you find it difficult to chew and unable to digest properly. If you do not respond quickly, the jawbone begins losing bone mass over time. Bone restoration may lead to changes in your facial structure and sunken cheeks. Small food particles may get stuck in between the teeth that can leave a negative impact on the surrounding teeth. If you have missing front teeth, you will more than likely choose not to talk or show your mouth in public, which has a knock on effect to your mental health and confidence. Endosteal implants – These implants are positioned surgically into the jawbone. After the surrounding tissue gets healed, a secondary surgery is needed to connect a post to original implant. Finally, the artificial tooth is fixed to the post, either individually or grouped on a denture or bridge. They are the most commonly used kind of implant and have the shape of cylinders, small screws or plates. Subperiosteal implants – They have a metal frame that is placed below the gum however on, or above, the jawbone. As the gums begin to heal, the frame gets fixed to the jawbone which are then attached to the frame and protruded through the gums. This kind of implant is used for patients who have shallow jawbone and cannot or do not want to undergo the process for rebuilding it. If you are missing one or more teeth due to tooth decay, trauma or gum disease, then you may be a good candidate for dental implants. Though an implant sounds like a scary dental procedure, it is considered by dentists and patients as the most suitable way of replacing tooth. You can restore your smile with this effective treatment. You won’t be able to understand if there is sufficient jawbone for dental implant treatment. A CT scan and an X-ray is done to know about the density of bone, volume and necessary information related to anatomical structures like nerves. Your dentist will check if the bone requires additional support which means there is the replacement of artificial bone or sinus lift to anchor implants firmly. It is advised that you take proper rest and stay healthy before and during Dental Implant procedure. Dental implants are meant to last for a 8+ years to a lifetime with proper care and maintenance. Regular brushing and flossing is important just like patients should go for routine dental check-ups twice a year. Positioning is also important for the longevity of a dental implant. Implants that are placed at the back of the mouth get more strain from chewing that can cause them to fail quickly than implants near the front of your mouth. The cost of dental implant may vary based on the brand. Straumann® is the finest implant at higher rate while Dentium is a quality tooth Implant at an affordable price. During the first consultation, our dental implant surgeon in London evaluates the X-ray carefully and then speaks with the patient. If the patient’s condition and bone tissue enables you to perform dental implant treatment, a customized treatment plan will then be prepared according to the need. The dentist might ask performing some other examinations or request for a CT scan, if needed to check the bone mass. The implant is placed into the jaw bone during the treatment. After the surgical procedure is done, the patient will be given advice and some instructions for bone recovery. If there is no bone tissue for Dental Implantation, a surgical procedure known as bone graft or bone augmentation is provided for replacing the bone tissue. The Dental Implant integrates into the jawbone and heals under the gum in 6 to 8 months after dental implantation. The patient needs to maintain good oral health and take proper medications during this time. The complete restoration is built on Dental Implant or implants after the healing period. There are different kinds of dental implants restoration, starting from single crown on one Dental Implant or bridge on two implants to full restorations, All-on-4 fixed dentures or full bridge on 6-8 dental implants. If you do not have any teeth in the lower jaw and not prepared for various implant placements, a conventional lower denture can be replaced by removable over denture. The success of artificial tooth and dental implant cannot be ensured without maintaining good oral health and hygiene. So, it is extremely important that the patient improves the lifestyle, if needed. After the prosthetic procedure, the patients need to go for a thorough check-up examination at least once in a year to know about their oral hygiene and the stability of Dental Implant. After the Dental Implant surgery is complete there might be some symptoms of swellings on the face or inside the mouth, severe pain and discomfort. This is quite common as Dental Implant surgery is some kind of involvement inside your body. If you suffer from tremendous pain, take some painkillers (provided by the dental surgeons at DS Dental) since they can help you handle the initial stage after the surgery. Besides, you need to take care of the affected area with ice to ensure that the swelling vanishes quickly along with prescribed antibiotics. Usually, the stitches should be removed in the next 7-10 days after the implantation surgery, however DS Dental uses resolvable stitches, which means you will have to visit the surgeon for removing the stitches. It is important to go for routine check-up after a Dental Implant then other dental treatments since it is a severe intervention into the body. Though the dentists at DS Dental in London use the finest materials available, it is advised to take care of your teeth and get the treatment done only from the experts. They will take care of your dental health and even help you in case there arises any problem in future. It is strongly advised to see your dentist after the surgery has been performed. The cost for dental implantation depends on the severity of the surgery, materials used and prosthetic works that have been suggested. However, there can be sinus lift or bone graft that can have an impact on the overall price of implant procedure. So, the cost associated with this kind of treatment will differ from person to person based on their dental health condition. Check out two cost examples for porcelain crown(s) on dental implants (3 unit porcelain bridge on two dental implants and full porcelain bridge on six dental implants) prepared only for you to give an estimation of the cost and necessary treatments that need to be performed. However, bone graft and sinus lift are not included in the calculation. Do you feel uncomfortable with your smile due to missing teeth? Get in touch with our dentists and regain your smile with improved confidence! 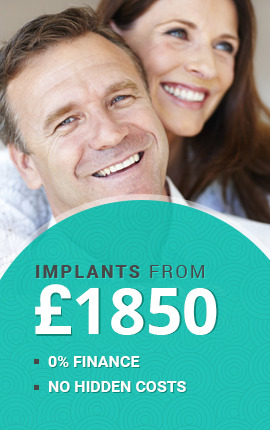 *charge of £50 for consultation will be refunded upon starting the dental implant treatment.